The history of this part of the city, and of Madrid itself, starts with the first fortified castle to be built on the banks of the River Manzanares. Constructed by the Moor emir Muhammad ben Abd al Rahman and given the arab name of Magerit (later becoming Madrid), it served as a base for the city's development. A myriad of small houses, churches and streets were built on the hills surrounding the fort, which was replaced by a gothic construction in the 15th century and finally by today's Royal Palace in the 18th century. This area of the city is called Madrid of the Habsburgs (and also Madrid of the Austrias), since the monarchs of this dynasty helped to stimulate its development in the 16th century. When Felipe II established his Court here in 1561, Madrid was nothing more than a small Castillian borough with a population of 20,000. Only a few decades later the population had tripled and Madrid had become the all important centre of a new and powerful empire. 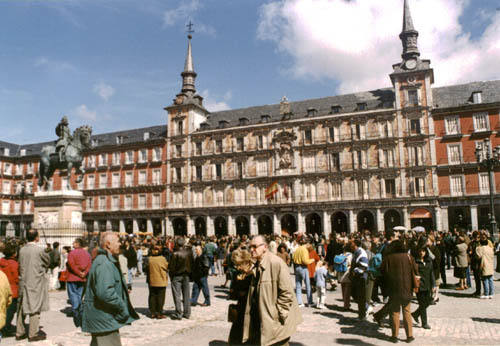 The aristocracy built their mansions here so as not to be distanced from the Court, the Plaza Mayor was built and the Puerta del Sol later became the geographical centre of Spain and a point of reference for all the city's vistors. As such, we begin our first itinerary here in Madrid's most central point. Take the Metro (lines 1, 2 & 3) or bus (numbers 3, 51, 52 or 150) to Puerta del Sol. As you come out into the square take note of its almost semi-circular shape. Look to the "flat" south side of the semi circle and find the clock tower. This is the famous clock all Spaniards turn their eyes to on New Year's Eve, guzzling down a grape to each of it's twelve chimes at midnight. Millions watch on TV and what sometimes seems like millions more brave the cold here in the square. If you're here on New Year's Eve this is a marvellous experience. The clock tower perches on a building called the "Casa de Correos", the head quarters of the Community of Madrid's Autonomous Government, outside of which is a stone slab on the pavement marking Kilometre Zero - the official starting point for Spain's 6 National Roads. Walk back west towards and past the Metro station on your right in order to walk a short way up Calle Mayor before turning left, then immediately right into Calle Postas. This short street leads directly up to one of the arched entrances to Madrid's expansive main square. The surrounding three-storey houses with their many balconies are still lived in by the fortunate few. Public executions, crowning ceremonies, bullfights, Inquisition trials and diverse fiestas have all taken place (and still do ... well, the fiestas at least) right here in the square. If you're following this itinerary and have entered the plaza from Calle Postas, the Casa de la Panadería (the Bakery) is on the right. Named after the bakery it replaced, the construction of this building and its colourful facade of frescos was initiated in 1590. Walk along this side of the plaza and on the right, under the arches, is a small but entirely fascinating Andalusian tavern, called the Torre del Oro and decked out in the green and white stripes of the Andalusian regional flag. 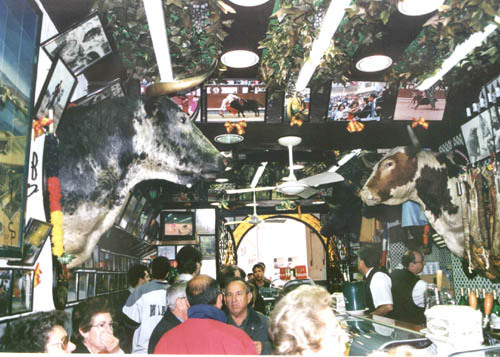 This tavern is a must-see for all but the sternest anti-bullfighting activists (who can stay outside and relax with a drink on the terraces of one of the rather expensive cafeterias), its walls brimming with amazing action photographs of famous bullfights, gorings included, as various personalities (including both Che Guevara and Franco!) watch from the sidelines. Several enormous fighting bulls' heads add to this collection of tauromachy. Order a fino (dry sherry) or a caña, which will be presented with a small tapa for no additional cost. Continue your walk around the square, taking in the curiously traditional hat shops. If you're here on a Sunday, you'll find the square full of collectors and sellers, forming a regular open air market for stamps and coins. And on the days leading up to Christmas, the square's packed with stands selling decorations, joke items and small figures for the Spanish tradition of making elaborate nativity scenes. 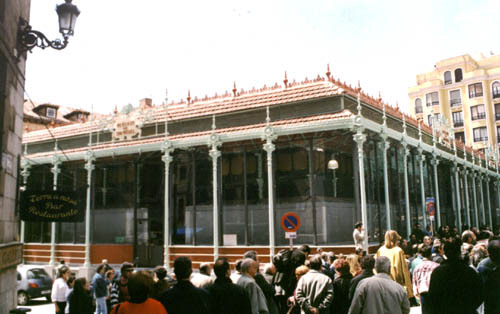 Opposite the Casa de Panadería, there's a convenient Tourist Information office and various other Ayuntamiento offices in the Casa de la Carnicería (the Butcher's). On this side, in the square itself, you'll find dozens of amateur artists willing to skillfully draw your caricature for around 12 euros - just stop and watch a while to see how its done. Having walked all the way round the square, stand looking at the Casa de la Panadería and take the north-west exit directly to your left, out onto Calle Ciudad Rodrigo and Travesía Bringas. 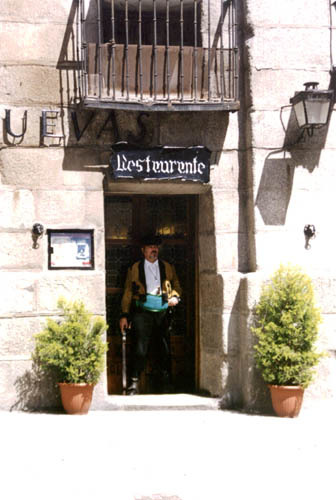 As you walk into Travesía Bringas, turn left down Cava San Miguel and then look to your right. A short way down the first small street of Plaza San Miguel is Madrid's last remaining market constructed in forged iron, the Mercado de San Miguel. Continue walking down Cava San Miguel and past the mesones on the left, wonderful stop-off places to sample a quick sangría accompanied by freshly made tortilla (spanish potato omelette). The last one of these mesones (Las Cuevas de Luis Candelas) is named after a famous bandit who is almost permanently represented outside by suitably dressed doormen, complete with pistol. You are now at the Arco de los Cuchilleros (the Arch of the Knifemakers). The talus shaped wall here was constructed by Juan Gómez de Mora to account for the lower street levels at this side of the plaza. In fact, the buildings here have 3 more floors than those at the other side. While you're here, check out Cuchis, a wonderful mexican restaurant famous for its good-natured, fun-loving waiters and the plaque outside which proudly anounces, "Hemingway never ate here". Walk a bit further down what is now Cuchilleros street. 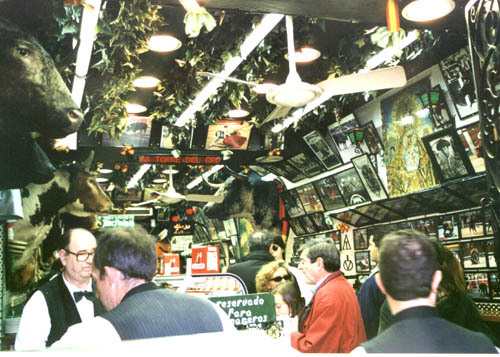 On the left you'll see a good "tablao" (a tavern where live flamenco dancing can be seen), situated just before the famous Botín restaurant. This high quality restaurant is supposedly the world's oldest, as mentioned in the Guinness book of records. Finally, Cuchilleros opens out into the Plaza de Puerta Cerrada. Take a right here down the Calle de San Justo and past another good Spanish restaurant, Casa Paco. Look down the first small street to the right, Pasadizo del Panecillo, where you can see the baroque façade of the Arzobispal Palace. Keep on down until you come across a small square, the Plaza de Cordón. Set back slightly on the right is the San Miguel church, designed according to italian baroque styles in the 18th century. The interior decoration is rococo but its most intereting point is the rather unusual convex façade. Turn back on yourself a little to go down Puñonrostro street towards the Plaza Miranda, where the Convent of the Carboneras was built in 1607 and currently houses several interesting paintings. Continue along Calle Codo until you come to the Town Hall sqaure. In the Plaza de la Villa there are several buildings with varied historic interest, such as the Casa de Cisneros. Originally a plateresque palace constructed in 1537 for the Cardinal Cisneros, this marvellous building was recently restored by Luis Bellido and today houses various Town Hall departments. 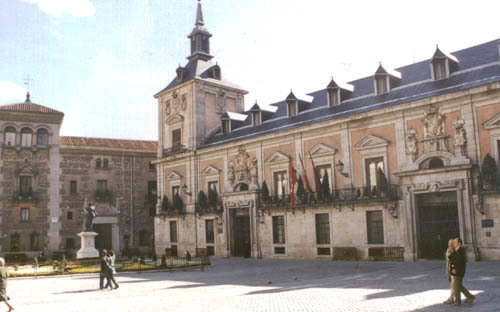 The La Casa de la Villa (previous Town Hall building) was designed by Juan Gómez de Mora in 1640, although other architects such as José de Villarreal, Teodoro Ardemans, Juan de Villanueva and Luis Bellido have also worked on its construction, adding, for example, shields, a neoclassic column and the baroque portal. 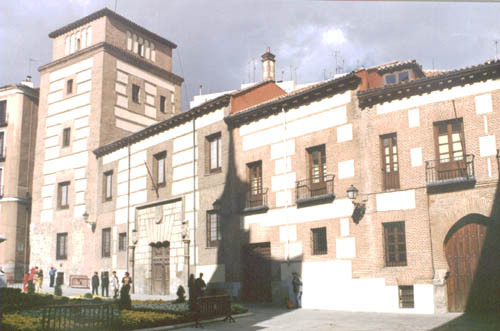 Both the Casa de la Villa and Casa de Cisneros can be seen when visiting the Municipal Collection, comprending the Town Hall's diverse donations and adquisitions, including many 15th century items. Goya's "Alegoría del dos de mayo" is kept inside this building, celebrating the popular revolt which led to the defeat of the French and today celebrated as a public holiday. The Torre de los Lujanes is the oldest construction in the plaza, dating from the early 15th century. This mudejan style tower and two portals are what remains of the former palace which was used to keep captive Francis I of France after the Battle of Pavia in Italy in 1525. Also to be found in the Plaza de la Villa is the Statue of Admiral Alvaro de Bazán, mounted on a pedestal of grey marble brought from the mountains of Elvira and given form by the architect Miguel Aguado. The 3 metre statue itself is the work of Mariano Benlliure. 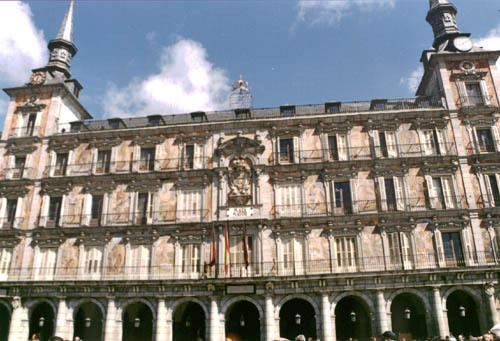 If you leave the Plaza Mayor to the east, the Santa Cruz Palace can be found in the Plaza de Provincia. 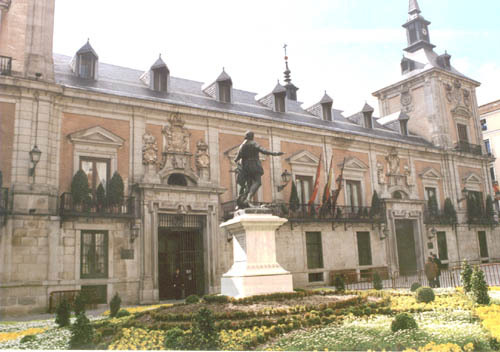 This building, now the headquarters of the Ministry of Foreign Affairs, was designed by Juan Gómez de Mora and constructed between 1629 and 1643. In the Plaza de la Paja you can see the Capilla del Obispo (literally, the Bishop's Chapel), Madrid's only gothic temple. Nearby, in the Plaza de Los Carros, stands the baroque Capilla de San Isidro and another baroque church, San Andrés, presides over the Plaza de San Andrés.